At Eli’s, there’s something for every taste! Handmade in Chicago, our desserts are hand-decorated and made with the finest ingredients. With over 40 flavors to choose from, it might be difficult to pick just one for everyone on your list. But we’re here to help! Here are some great gift ideas, or dial 800-ELI-CAKE and speak to a gift concierge. 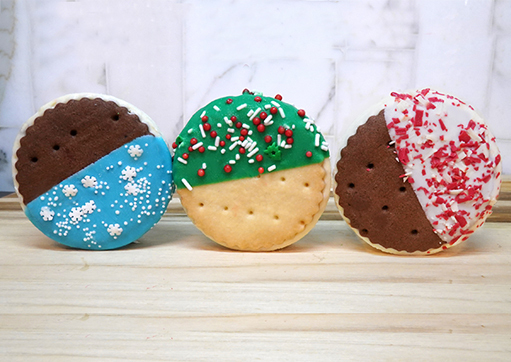 Give santa an upgrade from the usual cookies and milk with our new Cheesecake Cookie Sandwiches, Eli’s Cheesecake sandwiched between two cookies, dipped in colorful chocolate and decorated with festive sprinkles. Served frozen, they’re like everyone’s favorite ice cream sandwich – only richer and creamier. This gift will definitely land you a spot on the “Nice” list. 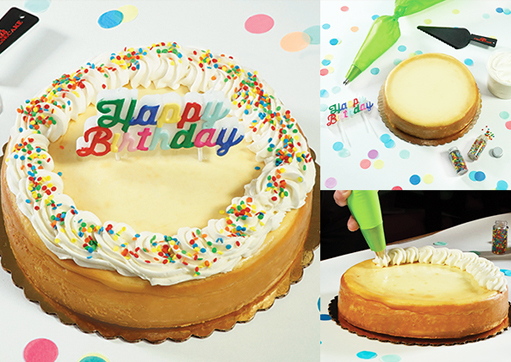 Making a good cheesecake is hard – trust us, we’ve been baking up delicious cheesecakes since 1980. But our DIY Cheesecake Tarts Kit makes it easy (and fun!) to bake Eli’s Cheesecakes at home. 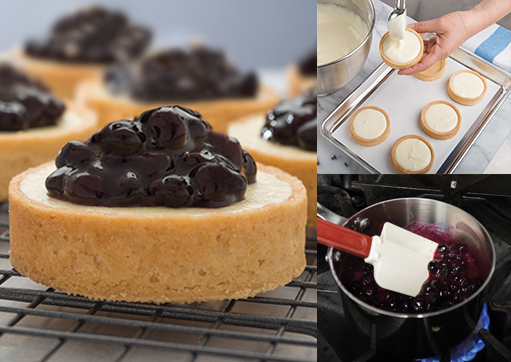 You (or your recipient) provide 2 eggs and some basic kitchen equipment and we take care of the rest: it includes everything you need to bake 12 homemade Blueberry Cheesecake Tarts. Serve your guests a handmade dessert…with a little help from your friends in Chicago. What’s more fun than food on a stick?! Our Dipper (the favorite dessert at Taste of Chicago, America’s largest food festival) is all dressed up in its holiday best for the season. Frozen cheesecake on a stick, hand-dipped in chocolate and decorated like a festive tree with green frosting and white sprinkles. Fun and forkless! Feed a crowd for under $80! Our original Tower of Cheesecake serves 40 hungry guests with three different cheesecake flavors, all wrapped up in a bow, ready for gift giving. Or try our other Towers and Gift Packs. They’re the perfect gifts for clients, customers, or Great Aunt Ida who always hosts the holidays at her house. Sometimes having a birthday during the holidays isn’t much fun – holiday gifts and birthday gifts somehow get lumped together into one. Treat that special December birthday gal or guy with our NEW DIY Birthday Kit. It includes everything your recipient needs to party: an undecorated cheesecake with frosting, a piping bag, and sprinkles to decorate the cake themselves (a gift and an activity in one! ); paper confetti, a birthday candle and an Eli’s cake server. You’ll make everyone wish it was their birthday was this month! Non-dairy Cheesecake? Yes, we know it’s an oxymoron, but it tastes so good we couldn’t resist calling it “cheesecake.” It’s made with fine Belgian chocolate and GMO free tofu (handmade in Chicago’s Edgewater neighborhood) which replaces cream cheese in this creamy dessert, resulting in zero cholesterol – but full flavor. It’s also certified vegan by the Vegan Awareness Foundation. And certified delicious. By us. Shop in your pajamas at shop.elicheesecake.com or call 800-ELI-CAKE. Order by 11am CT on December 11th for delivery by Hanukkah and by 11am CT on December 21th for delivery by Christmas. If you’re lucky enough to live near Chicago, visit our cafe and retail store on the northwest side. This entry was posted on December 1, 2017, 12:07 PM and is filed under Products, Seasonal. You can follow any responses to this entry through RSS 2.0. You can leave a response, or trackback from your own site.